Check for Internal Consistency (if model reduction is used) where each step just requires about one function call. In this example file, the entire problem will be solved total of 3 times. First, KS model will be solved without any model reduction. Second, KS model will be solved with model reduction, to compare how well the model reduction works. Lastly, different parts of observables will be introduced to compare how the model reduction works with different requirements. We have updates to Internal Consistency check coming in the future. Ahn, SeHyoun, Greg Kaplan, Benjamin Moll, Thomas Winberry, and Christian Wolf. 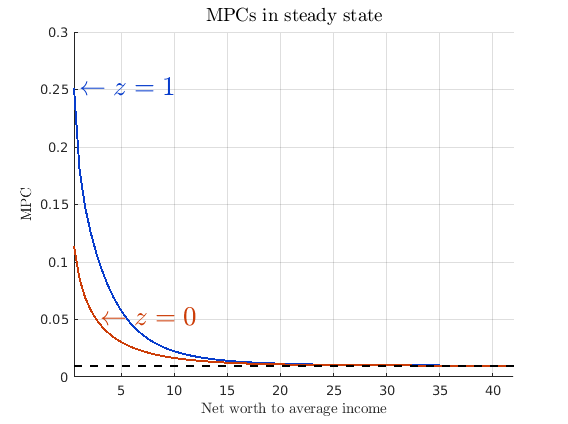 "When Inequality Matters for Macro and Macro Matters for Inequality." 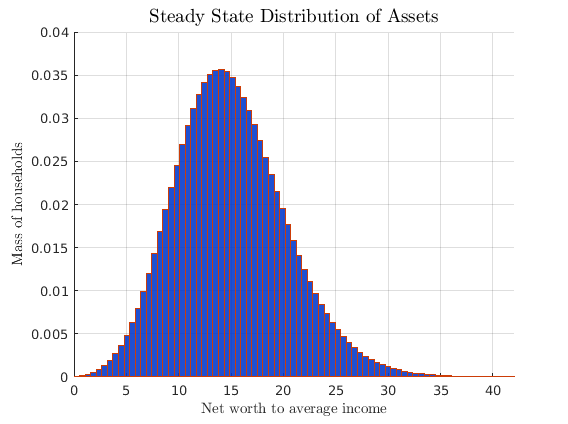 Krusell, Per, and Anthony A. Smith, Jr. "Income and wealth heterogeneity in the macroeconomy." Journal of political Economy 106.5 (1998): 867-896. Just need to include folders containing the files in the path. 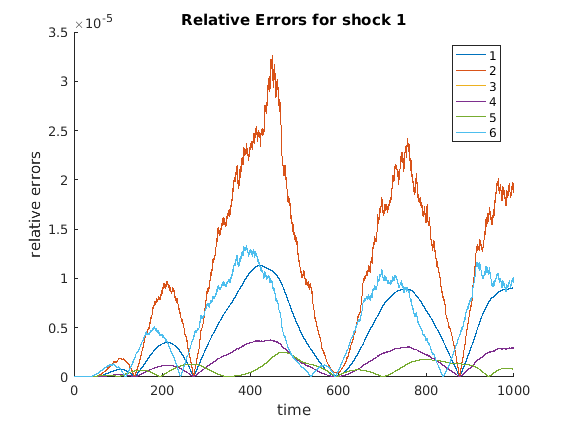 Non-stochastic steady state can be found using any methods. In particular, example codes can be found at http://www.princeton.edu/~moll/HACTproject.htm. For large problem, we are forced to take explicit update, so it can take awhile to run, but the good thing is that this only needs to be run at the end. We are currently working on this, so speed for this part might improve in the future. (For small problems, the speed is not an issue). A different consistency check is in works, and will be updated in the future. It is possible to include other variables into observables. In this part, different parts of the distribution will be included in the model reduction to show how the Krylov subspace based model reduction behaves. 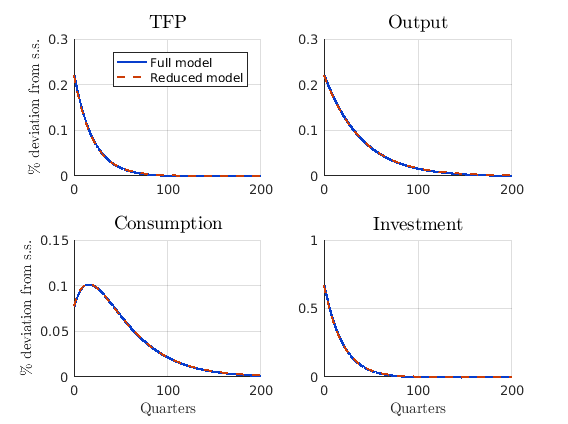 To that regard, the reduced model is solved while including different parts of distribution as part of the observable. In this case, a very strong requirement of knowing the probability density value at different grid points of the distribution g is taken. 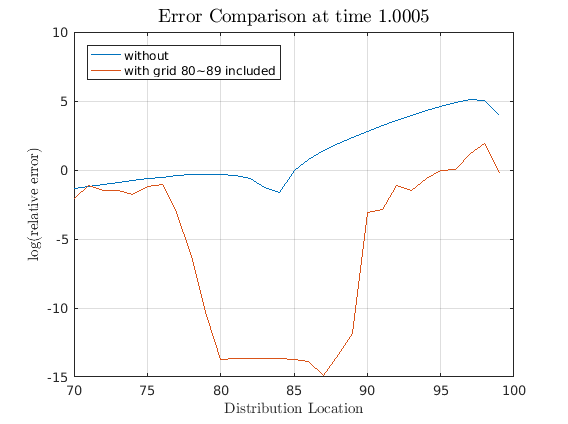 In the first case, 80th through 89th grid points were included in the parts that we consider to be observable. 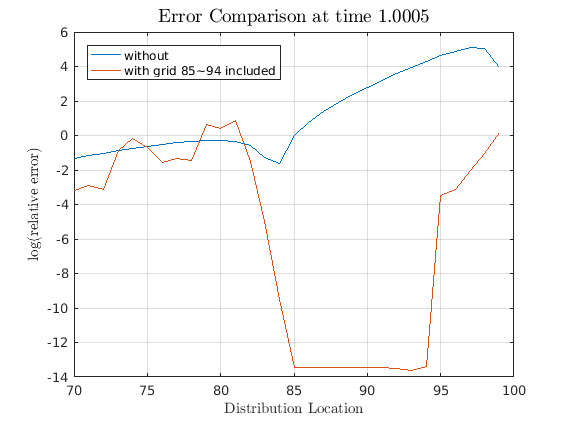 For the second example, 85th through 94th grid points were included in observable. Note how the errors decreases only for the parts that we required to be observable while the irrelevant parts were reduced away. This is the magic of Krylov subspace based reduction in action. Though we could solve the full model for the simple Krusell-Smith case, this ability to reduce away irrelevant part will be essential for bigger problems. and just copy the lastline of the documentation string. Alternately, you can call "doc function_name" to read the doc string in the MATLAB help browser, and "edit function_name" to see the function codes.